and the “Safe House Safer Society”, a program partnered with the Church of North India which operates safe houses for children who are victims of human trafficking. 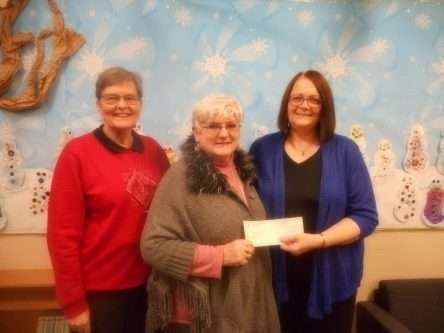 The Kamloops United Church Preschool has been a focus of outreach for KUC since 1954. The goal of the preschool is to provide affordable preschool/out-of-school care for any member of the Kamloops community. Pictured here are Lynda Fisher and Diane Stuart (KUC’s Global and Community Action’s representatives) presenting the $1325.66 cheque from KUC to the Preschool Administrator, Patti Pernitsky.